By now, most spring and summer flowers have faded, but don’t fret: The shorter days and cooler temperatures have brought with them an autumnal kaleidoscope of yellows, golds, oranges, bronzes, reds and purples. Celebrate the change of seasons with a walking tour of the Gardens and an opportunity to learn about several of Colorado’s native plants that display beautiful fall colors. Please note that there are a variety of factors (e.g. weather, precipitation and growing conditions throughout the year) that contribute to the timing and intensity of fall color. Thus, some of the plants on this tour may have already reached their peak fall color or may still be in the process of changing colors. Begin your tour at the Ponderosa Border sign on the curvy path on the northeast side of the UMB Bank Amphitheater. The first plant, sticky geranium (Geranium viscosissimum), is to the right of the sign and in front of a smooth, gray rock. Commonly found from the plains to the subalpine life zones of Colorado, this perennial herb has leaves that flush shades of yellows, oranges and reds in the fall. Because the pink to rose-purple flowers have a long bloom season, flowers may be present even as the leaves are changing colors. This drought-tolerant plant, which is visited by butterflies and native bees, is a great addition to perennial borders, rock and woodland gardens. Follow this with a walk down the unpaved pathway to the left of the Ponderosa Border sign. Many plants in this garden, including some of the oaks, sumacs, maples and dogwoods, are native to Colorado and exhibit fall color. Towards the end of Ponderosa Border, you will arrive at a fork in the path; stay left to continue through the forest. On the right side is a tall shrub with maple-like leaves, which is commonly referred to as a golden currant (Ribes aureum). As fall approaches, the leaves turn scarlet one by one until the entire shrub bursts into a blaze of color. In addition to fall color, this plant has clove-scented flowers that are as golden as the spring sunshine. Shiny, bluish-black berries follow, which are attractive to songbirds. Bonus: To the right of the golden currant, the forest floor is covered with Oregon grape (Berberis repens). This native has evergreen leaves, some of which turn red in the fall, contrasting nicely with the remaining green leaves and numerous clusters of icy blue berries. Next, hike across the Gardens to the Laura Smith Porter Plains Garden and enter using the stone path across from Dryland Mesa. Turn right at the fork in the path and immediately look for 2- to 3-foot-tall tufts of grass that display striking shades of rust and copper. Also notice the silvery-white seed heads, which are particularly stunning when backlit by fall sunshine. The grass is little bluestem (Schizachyrium scoparium) and the common name describes its bluish-green summer foliage. A component of the tallgrass prairie ecosystem, little bluestem makes an excellent backdrop for showy native asters such as Mexican hat (Ratibida columnifera), black-eyed Susan (Rudbeckia hirta), blanket flower (Gaillardia aristata) and purple coneflower (Echinacea purpurea), while also providing food and shelter for wildlife. Backtrack to where the path forks and stay to the right. Wander through the shortgrass prairie and continue on the path as it curves to the right, skirts the edge of the pond, and eventually becomes a boardwalk. Leave the wetland by way of an old, wooden bridge, and enter the shady riparian woodland that is dominated by Western chokecherry (Prunus virginiana). During fall, these trees light up the forests and canyons of Colorado with spectacular shades of yellow, gold and orange. 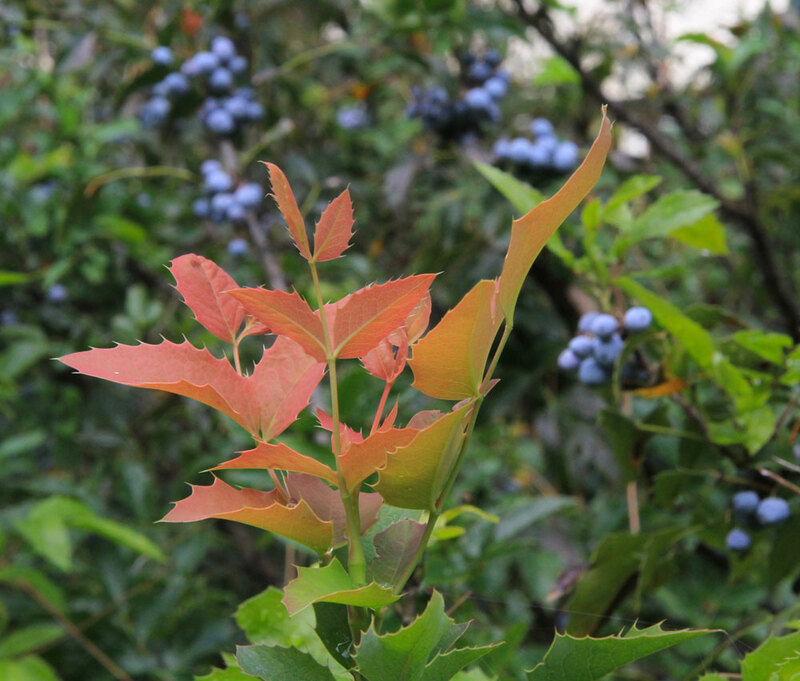 Chokecherry leaves also support native butterflies and moths, and the purplish-black berries are important for songbirds. Chokecherries do tend to sucker, but there is a new cultivar, Prunus × virginiana ‘P002S’ Sucker Punch®, which has been selected for not suckering. This cultivar has reddish-purple fall color and can be seen in the Darlene Radichel Plant Select Garden. Continue following this trail until it intersects with the main path, and then turn left into the woodsy Gates Montane Garden. This garden boasts many plants native to the Southern Rockies, and some of them display robust fall coloring. 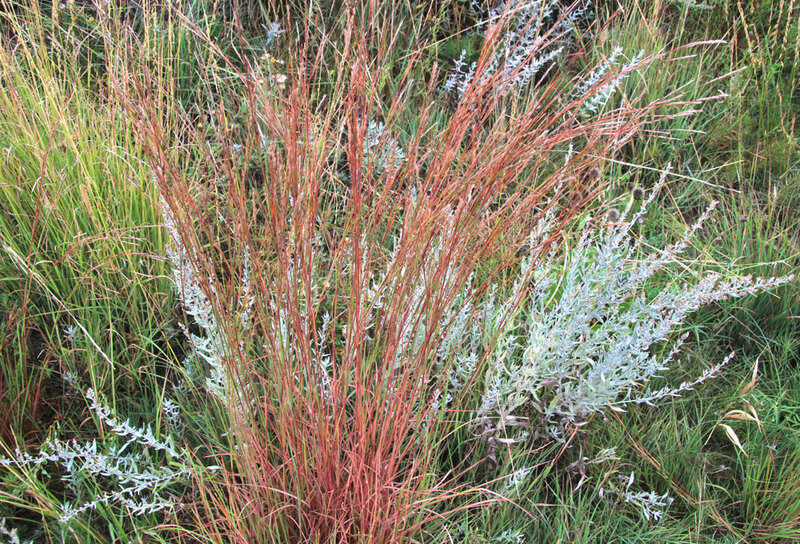 Before exiting Gates Montane, there is a thicket of redosier dogwood (Cornus sericea), a widespread shrub found in the cool, damp ravines and shady canyons of Colorado. 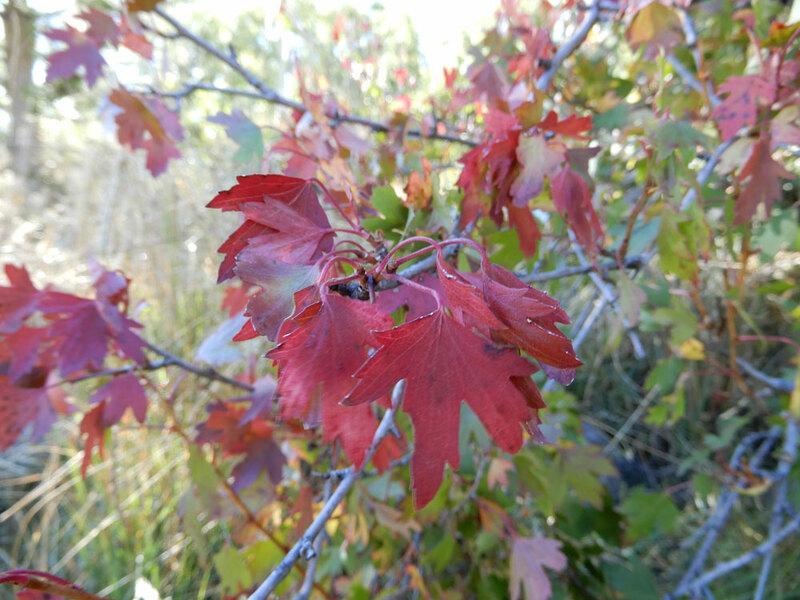 This native species has leaves that exhibit various shades of orange, red and purple in the fall. As autumn succumbs to winter, leaves drop to expose brilliant red twigs that provide interest until spring paints the landscape green again. 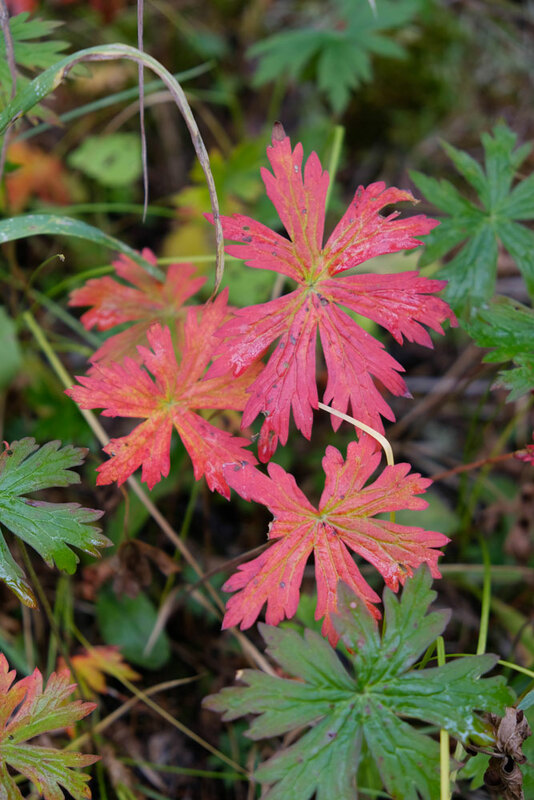 Sticky geranium, golden currant, little bluestem, chokecherry and redosier dogwood are just a few of the native plants that brighten Colorado’s wildlands and urban landscapes during autumn. There are many more plants throughout Denver Botanic Gardens which herald the changing season with fall color. For more leaf-peeping of native plants, visit any of the Gardens of the West as well as the Intermountain North American bed in the Steppe Garden. In closing, welcome to autumn, “a second spring when every leaf is a flower” (Albert Camus).